Tiftickjian Law Firm, P.C. is a Colorado law firm with a focus on DUI defense, drug related charges and major traffic offenses. 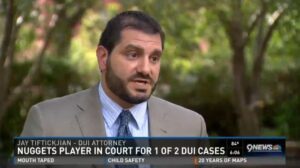 Criminal defense attorneys Jay Tiftickjian, and James Nechleba, litigate cases in Denver and throughout Colorado with a primary focus on driving under the influence of alcohol and/or drugs cases. In addition, attorney Douglas Barnes provides over 30 years of experience as a defense attorney and former public defender. Our law firm is in the Cherry Creek area of Denver, and we serve clients throughout Colorado, and have handled cases in most counties across the state. If you have been charged with DUI, DUID, DWAI, a major traffic offense, or have a drug-related charge pending, we can assist you navigate the court system and can give you every chance of maintaining your dignity and livelihood. The first step in any successful attorney-client relationship is exploring the client’s entire situation. This includes a detailed discussion of the facts and circumstances surrounding the case and the client’s background. We know from experience that this effort is critical in our attempts to get the results our clients expect. Discussing the possibilities of great outcomes without knowing the whole picture is not in potential clients’ best interests, so instead of boasting about past case-results and the possibilities of “wet reckless” pleas and other extraordinary outcomes to clients during the initial consultation, we endeavor to get a full picture of a clients situation and background in order to properly advise and put the best game-plan into action that is tailored to each client’s unique situation. We also believe that our clients must be kept fully informed at all times. This includes taking the time to address the client’s concerns and fears as well as providing timely information regarding updates and the progress of the case. We can get the best result possible in your case, but if we don’t keep you informed throughout the process, then we have not fully done what you hired us to. We are an aggressive defense firm, but we also understand that an aggressive approach may not always be the best approach. While this law firm has a reputation for providing excellent trial defense, we understand that a quick and economic resolution may also be in a particular client’s best interest. We strive to tailor your defense and seek resolutions based on what your personal goals are. If you have been charged with Driving Under the Influence (DUI) or another criminal charge, we will do everything within our power to find the best defense in your case and to help achieve the best outcome possible. Let us know what we can do for you today by calling us at 303-384-5280 or by contacting us through this website to request a consultation with an experienced DUI defense attorney from Tiftickjian Law Firm.